It’s a whopper all right, 213 centimetres by 132 centimetres of bun, patty and pickle. We’re talking about the Claes Oldenburger, which, after being out of sight for close to three years, returns this weekend to the menu of the Art Gallery of Ontario in Toronto. Its proper name is Floor Burger because … well, because that’s where you’ll find it, in this case all soft and puffy and flush to the boards of the Odette Gallery near the AGO’s main entrance. But since it was made such a long time ago – 54 years ago, in fact – by the pioneering New York pop artist Claes Oldenburg (with major help from his then-wife Patty Mucha) it’s well-nigh impossible not to get punny. And lest we forget, the artist himself turns 87 later this month. Yet it’s a refreshed Oldenburger people will experience, “stabilized,” to use the preferred museological adjective. Floor Burger’s been in the AGO’s permanent collection since early 1967, having been purchased from New York’s Sidney Janis Gallery for $2,000 (U.S.). 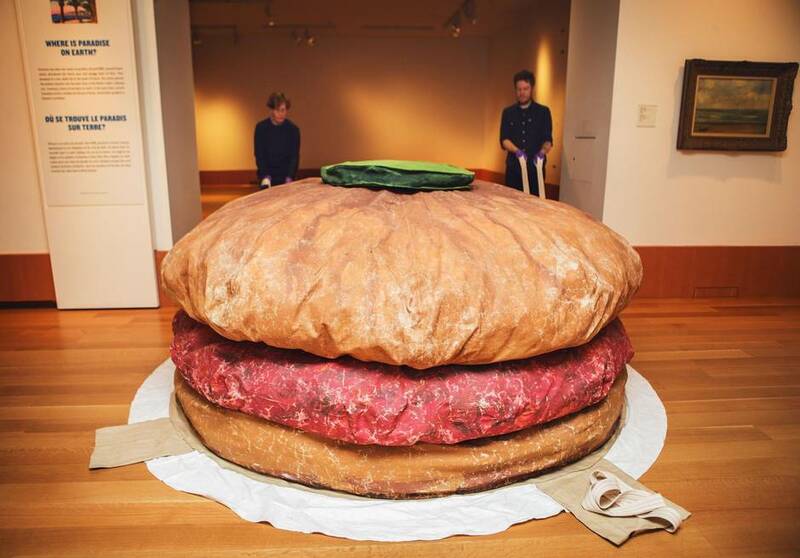 But it wasn’t until late 2012, after New York’s Museum of Modern Art asked to borrow the faux comestible for a double-barrelled Oldenburg retrospective in spring 2013 that the AGO decided it needed some sprucing up courtesy of in-house conservator Sherry Phillips. Fittingly, it’s fashioned from very humble materials – cotton duck canvas painted with acrylic, the interiors stuffed with upholstery foam and empty cardboard ice-cream cartons, inserted via a zipper sewn by Mucha into each form’s underside. (Mucha sewed all the parts of the work.) Not for Oldenburg, in other words, the concrete plinths or glistening bronze, distressed steel and posh marble that hitherto mostly defined sculpture. 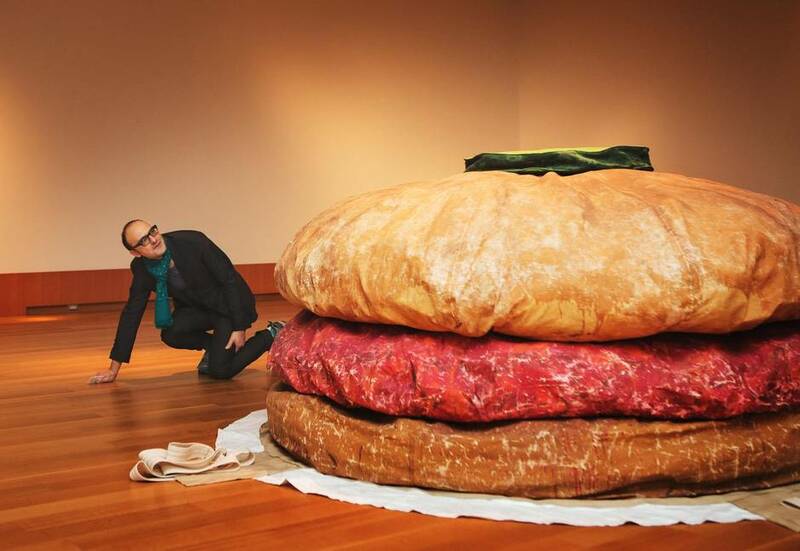 Indeed, when the Swedish-born Oldenburg first publicly displayed Floor Burger (or, as he originally called it, Giant Burger) at an Upper West Side gallery in September, 1962, it was joined by another two of his large soft creations, Floor Cone and Floor Cake, both now in MoMA’s permanent collection. “Extremely well made” was Phillips’s characterization of Floor Burger earlier this week. However, its very softness and the mobility of the stuffing beneath the flexible canvas have made it susceptible to wear and tear. “Over age, foam loses its loft, its cushioning,” Phillips said while watching two installation technicians drag the behemoth into the Odette Gallery on a specially made canvas serviette. Unsurprisingly, by late 2012 “the top bun was looking less and less like a bun.” To stabilize it, she repositioned the cartons and foam inside the bun (“I did not remove any of the original contents”) and, for further plumping, inserted five bags of unbleached cotton filled with Ethafoam. Luckily, “the patty and lower bun didn’t need anything; they looked good.” Phillips and her team went on to delicately clean the whole burger. No retouching was done to any of the paint; rather, Phillips painstakingly used adhesive to rebind to the canvas surface whatever layers of paint were loose or flaking. Today, it’s safe to say Floor Burger ranks as one of the AGO’s most valuable works of modern art and one of its most popular. But it wasn’t always thus. 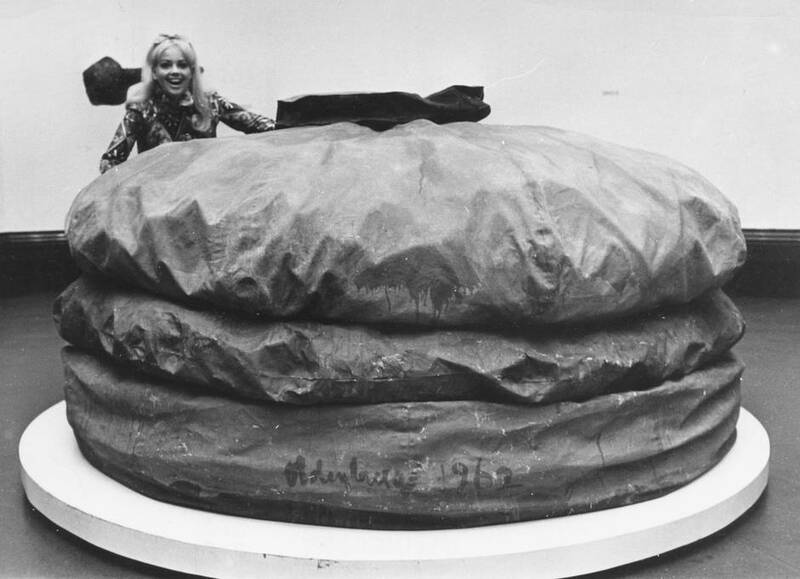 At a time when a real hamburger could be had for as little as a quarter, the AGO’s director William Withrow felt compelled to fend off accusations of financial squandering when the gallery announced its purchase of the Oldenburg on Feb. 4, 1967. “Never in the history of the art gallery,” Withrow declared, “has one cent of tax money ever been spent on the purchase of a work of art.” The funds were raised and donated by its volunteer Women’s Committee. After its installation, the burger didn’t get much respect from some AGO patrons. There are unconfirmed reports of visitors jumping on it and others, confirmed by Phillips, of individuals using it as a giant bean-bag chair. There’s also a story about the pickle. The one atop the AGO burger is not the original. It seems Brydon Smith, then the AGO’s curator of modern art, purchased the Oldenburg during its run at the Janis Gallery as part of an exhibition titled Dine, Oldenburg, Segal: Painting/Sculpture. It’s unclear if Floor Burger had a pickle during that show or if the condiment disappeared afterward. Regardless, Oldenburg informed the AGO that the work did indeed come with a pickle and “when your show opens, there will be a pickle.” True to his word, Oldenburg personally brought the replacement pickle by jet to Toronto from New York, pretending the soft sculpture was a pillow for in-flight use so as to pass through customs unscathed. SuperReal: Pop Art from the AGO Collection opens Jan. 16 for an indefinite run at the Art Gallery of Ontario in Toronto.